NEWINGTON - It was a game set up to feature Newington’s Joey Zawisza against New Britain’s Will Homar on the mound and it didn’t disappoint. Both pitchers tossed complete games. The Indians just happened to get the best of the Hurricanes in the end, winning 2-1 Monday afternoon. The winning run came in the bottom of the fourth. Both Zawisza and Homar allowed only three hits, most of them doubles. Gunnar and Cooper Johnson hit one each for the Indians, while Ruffino Santiago, Francisco Alvarado and Danniel Rivera each finished with one for New Britain. But the Hurricanes (12-5) committed three errors to Newington’s (11-6) one. Southington 5,Conard 0: The Blue Knights were able to move to a game above .500 after a strong showing from starter Justin Verrilli. The senior gave up seven hits to the Chieftains, who were unable to capitalize against Verrilli. The pitcher also got some help early from his offense, as Southington had a 3-0 lead after the third inning and cruised the rest of the way. Both Dan Topper and Jeremy Mercier hit a double apiece for the Blue Knights. New Britain 13, Newington 2: It was a bit of a slow start for the Hurricanes, but a strong finish as they scored 12 runs over the final four innings. Amanda Jacobs hit a two-run homer for New Britain, while teammates Gianna Gonzalez went 3-for-4 with an RBI and Jenna Lawson drove in five, three of which came on a bases-clearing triple. In the pitching circle, Joseleen Rivera was once again nearly unhittable as she threw a two-hit complete game, striking out five. Norwich Tech 3, Goodwin Tech 2: The Gladiators almost engineered a comeback. Leina Lopez-Rivera hit a two-out, RBI double in the seventh to cut Goodwin Tech’s deficit to one. The Gladiators just couldn’t generate anything else. They also had trouble containing Kalli Campbell, who finished with a double, triple and home run for Norwich Tech. The homer in the fifth proved to be the winning run. Valerie Ramirez took the loss for Goodwin Tech despite pitching a solid game. She also had two hits, including an RBI single. Newington 3, Maloney 0: The way head coach Curt Burns put it, the Indians need to take care of the matches they’re supposed to win. They did just that with an easy sweep of the Spartans with set scores of 25-2, 25-13, 25-10. Luis Egbuna led Newington with 11 kills. Evan Metzger had 15 assists and three aces and Collin Liedke finished with eight digs. Southington 3, Farmington 0: The Blue Knights picked up an important win over the Indians, allowing them to continue their dominance over the CCC in the regular season. Southington (13-1) took the match after set scores of 25-20, 25-6 and 25-17. Tim Walsh had 13 kills to lead Southington. Zack Morgan and William Pfanzelt finished with double-digit assist totals with 19 and 16 respectively, while Niko Sophroniou had 15 digs. 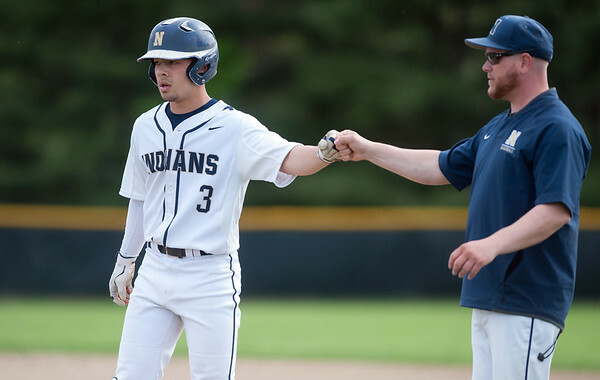 Newington 7, New Britain 0: It was a rather one-sided affair in favor of the Indians, who were able to secure a postseason berth in the process. Sean Davis, Matt Utter, Ben Arora and David Magsao earned singles wins for Newington, while the duo of Gynno Bacaoco and Daniel Lasota; Ateeb Rahman and Lukas Klin; and Videep Soni and Michael Zhai earned doubles victory. But perhaps the most interesting match of the day was between Davis and the Hurricanes’ Ali Saleh in the No. 1 singles. Davis won the first set 6-1, only to have Saleh win the next one 7-5 with David taking the tiebreaker 10-7. Newington 4, New Britain 3: It was a back and forth match all afternoon with the final match, the No. 3 doubles, deciding the outcome. Newington’s Kelly Iskra and Lucy Slattery got the better of New Britain’s Devon Riley and Kiara Matins 7-5, 6-4. “It was a hard fought match that came down to the end,” said Newington head coach Sean Hussey, whose team has now qualified for the state tournament after earning its eighth win of the season. Other wins for the Indians came from Olivia Rozio, Mara Klin in singles and Lindsay Weaver and Julia Mazur in doubles. For the Hurricanes, Claire Palin and Larissa Tabb picked up singles victories as Danya Alboslani and Yayaira Asisbaya came through in No. 1 doubles. Southington 6, Conard 1: The Blue Knights didn’t have much difficulty with the Chieftains, dropping the final doubles match of the afternoon. But even that wasn’t an easy win for Conard as Southington’s Gianna Wadowski and Emma Wojcicki played Maggie Noble and Nora McGowan in the longest match of the day before falling 7-6(6), 7-5. Abby Murphy, Coral Tommervik, Molly Murphy and Joelle Stublarec picked up singles wins for the Blue Knights, while Carolyn Callahan and Chantelle Gimenez, and Samantha Barmore and Madison Beaudoin earned doubles wins. Berlin 198, Middletown 242: The Redcoats picked up an important conference win over Middletown as they continue to shoot well, hitting below 200 for the second time this season. Berlin’s Jackie Cooper was the medalist on the afternoon as she shot a 46, while Alena Kittleman (49), Jessica Nappi (51) and Bridget McQuillan (52) also scored for Berlin. New Britain 252, East Hartford 285: The Hurricanes picked up their second win of the season after a strong showing from their top two golfers. Cate Keithline and Kendra Levesque were both co-medalists for New Britain after shooting a 61. Kylie Griffin and Leah Gaffney rounded out the team’s scoring with a 65 each. Newington 200, Plainville 289: Led by medalist Chloe Bilodeau, who shot a 46, the Indians took advantage of playing on their home course. Jessica Pierzchalski (49), Taylor Kelly (51) and Maddie Massarro-Cook (54) rounded out Newington’s score. Middletown 190, New Britain 215: The Hurricanes shot well at times, they just couldn’t get the better of the Blue Dragons. Brennen Maxfield was the medalist of the match after shooting a 40 for Middletown. Tim carrier was New Britain’s low scorer with a 48 and was followed by Arthur Bell (54), Johnny Morell (55) and Dylan Washington (58). Posted in New Britain Herald, Berlin, Goodwin Tech, New Britain, Newington, Plainville, Southington on Monday, 14 May 2018 21:18. Updated: Monday, 14 May 2018 21:20.